School Breakfast Programme ART "availability" /transport to hospital AIDS Education/prevention Teams aren't "ours"
The Matilda Project is in funding partnerships with teams of volunteers in Zimbabwe who organized themselves to respond to the HIV crisis. 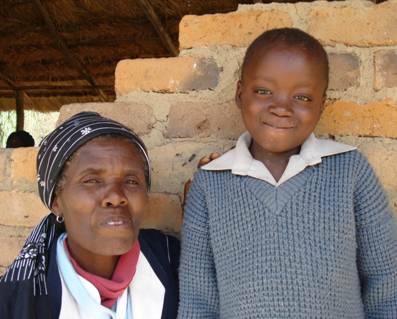 These teams are in 3 different locations in Zimbabwe: 2 in rural areas with a link to either a clinic or mission hospital, and 1 in Bulawayo, attached to a church there. HBC volunteer with a young patient who had been hospitalised when he had an extreme reaction to Cotrimoxazole, an anti-biotic used to treat opportunistic infections. This boy lives in a Child Headed Home cared for by his older sister. 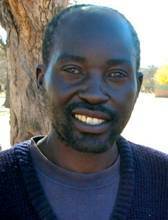 Food packs are delivered to them every 3 months and he benefits from the breakfast programme in his school. When he needs more medical attention Willard brings him to hospital with other patients in the Hilux. soap for washing patients and laundry, Vaseline, cotton wool and methylated spirits to clean lesions/bedsores, paracetamol for pain and fevers, bleach which kills the HIV virus, gloves. 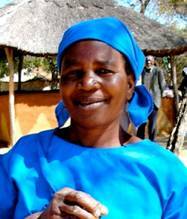 Carers wash patients, sweep compounds, collect water, sit with the patient and family, dress sores, and much more. Each village has a HBC co-ordinator who keeps records of all the patients and orphans in their area. Because of the co-ordinators’ hands-on knowledge of their village, we can supply a basic food-pack to each child living in a Child Headed Home without income or state support. The co-ordinators also ensure that each patient is cared for and visited regularly by local volunteers. Supplies are distributed to volunteers by co-ordinators. Village demographics: E.g. one of the villages has 173 homes and 169 orphans up to 17 years of age (2010 figures). 13 of the homes are Child headed. There are 22 trained HBC volunteers caring for 60 patients. Less than 5 are terminally ill at a given time. Mortality rate : During 2010 in 11 villages 114 HBC patients died HIV-related deaths, despite anti-retroviral drugs being available at the government hospital 60 km away. The great majority of those who died were the parents of young children. 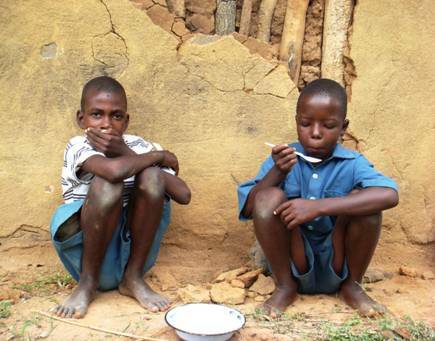 Orphans: Zimbabwe has an estimated 1.4 million orphans out of a population of 12.5 million (UNICEF estimate 2009). About 30% of the enrolment in primary schools are children who have lost parents. Many of these children cannot pay their school fees. The schools breakfast programme we began in 2005 now feeds 2,500 primary school children every school day. So that they benefit from both education and a hot meal each day we’ve paid fees for those who couldn’t afford to stay at school. 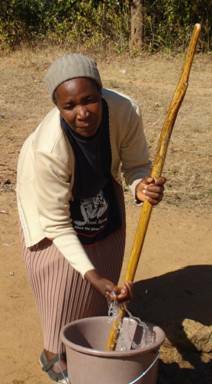 Lots of families have relatives who have emigrated for work and who send support back to their families in Zimbabwe. 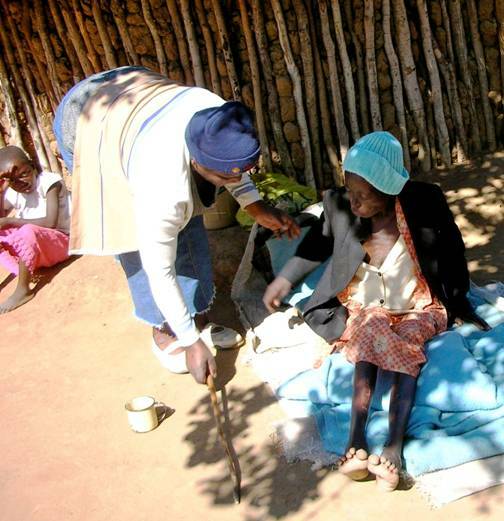 During a visit in 2009 with a GP trained in palliative care, it became obvious that a major challenge in rural areas is transport to medical care, especially to a hospital where life-saving anti-retroviral therapies (ART) are prescribed and available. For the terminally ill, most of whom have no income, transport is unaffordable. In 2010 Matilda Project bought a 4X4 Hilux for the Community Care Programme in the Matopas so that Willard can make regular trips to bring patients to hospitals. This is already helping to slow down the mortality rate. Patients who start taking ART show very significant improvements in their health, and may live for many more years. Their children can be raised by their own parents. All HBC volunteers are trained in HIV prevention. 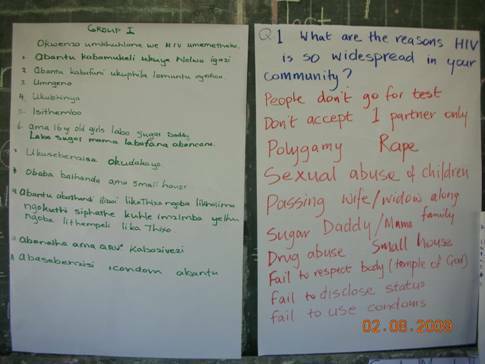 At a workshop on Palliative Care held in 2009 for over 70 HB Caregivers, a long feedback session was held on the reasons why HIV is so prevalent in the villages and what can be done to reduce prevalence. The delegates were extremely well-informed about the behaviours that have contributed to the pandemic, and recommended steps to be taken to bring the infection rate under control. Hunger/”food insecurity” is a significant factor in risky sexual activity. (E.g. Teenage girls visiting “sugar daddies” to exchange sexual favours for food during severe food shortages.) A virus that will kill you in 5-10 years time seems a lot less relevant when you have no food and no money to buy any. The Matilda Project does not exist in Zimbabwe! The teams we are in partnership with are indigenous, “grass roots”, run by Zimbabweans who are much better placed than us to identify the needs of their own communities and the best ways to respond to those needs with the funds available. Local know-how matters in these hard decisions. It also contributes greatly to “sustainability”. Because the care work and breakfast programme are staffed by volunteers approved by their communities, they have a high level of commitment and sense of ownership of the programmes, and pride in them. The myth of people “waiting for hand-outs” that we sometimes hear in Ireland is demonstrably untrue! Come with us and see for yourself! A widow in her 40s, outside her home being assisted by a HBC volunteer. She died in 2009. Her youngest daughter was about 7 years old. Matilda Project grew out of the challenge Jesus gave to “do to others what you’d want them to do to you”. Thinking about a loved child or parent or spouse dying from terminal illness without good/any medical care, or even water close to home to wash with or a mattress to lie on seemed to demand a response! Each of the partners we work with is a faith based organization. The Tshelanyemba HBC team work from Salvation Army mission hospitals; Nehemiah Project’s office is based a church in Bulawayo; Willard’s Community Care Programme is part of ACET. Care is given freely to those who need it, and without “strings attached”, regardless of the client/patient’s faith status. ACET Ireland adopted the Matilda Project in 2001. This gives the project registered charity status as part of ACET Ireland.